If you have time, check out my friend Thomas Creedy’s Society of Vineyard Scholars’ 2013 paper, “Gathering for the Lord’s Supper – the Table at the Center.” Creedy’s paper is quite good and provides some healthy challenge to the view that I have had in the past and provides some helpful direction towards where I think I am going. I tend to lean towards a “closed communion” perspective regarding who should participate, but I do so with some nuance. I think this paper will help me think through this issue a bit more and will, perhaps, help me sharpen my own view. I’m thankful for it. Other significant influences upon my understanding of the Eucharist would be John Calvin’s Institutes, Robert Culver’s Systematic Theology, John Hammett’s Biblical Foundations for Baptist Churches, Nathan Finn’s Baptism as a Prerequisite to the Lord’s Supper, Carey Publications’ Local Church Practice, the articles in the book edited by Thomas Schreiner, The Lord’s Supper, Tim Chester’s A Meal with Jesus, and Craig L. Blomberg’s Contagious Holiness. I think those works are some of the finest on the subject. I now add Creedy’s paper to the sources I will continue to count as helpful! 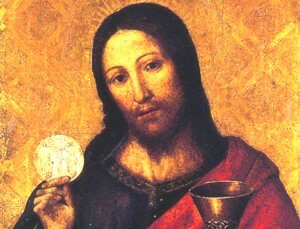 One of the major nuances I would add to my modified “semi-closed” and now called “kingdom-lensed” perspective on the Eucharist is related to how the table is guarded. Historically, churches that enforce a closed table tend to do so in less-than-winsome ways. They tend to come across as quite legalistic and controlling, especially when one considers how some churches used to fence the Table and require participants to give a communion token to partake! In my opinion, rather than “guarding” the Lord’s Supper by telling people they can and can’t participate, I think we should help guide people to discern whether they should or shouldn’t for themselves. We can do this through conversations that are far more relational and less “top down.” I think people should, as much as possible, determine for themselves whether they are moving toward Jesus, moving away from Jesus, or just standing still. We can obviously help them in the process of discernment, but sometimes I think church leaders jump to conclusions to quickly. One of the significant problems, I see, in how people carry out the Lord’s Supper in their worship gatherings has to do with lack of clarity. It seems that the Lord’s Supper often functions as a quick recap and the depth and wonder and glory of the gospel are rarely fleshed out. Thus, people are unclear about how the Lord’s Supper is a significant pneumatological means of grace or of who should be participating (all sinners turning to Christ!). I’ve written about this before (here, here, here, and here).